Bubble? You said bubble. Just read about it…. As I mentioned recently, a friend of mine gave me a collection of old Red Herring magazines. A funny byproduct of this gift is that I noticed that the number of pages of the Red Herring seemed to follow closely the Internet bubble. 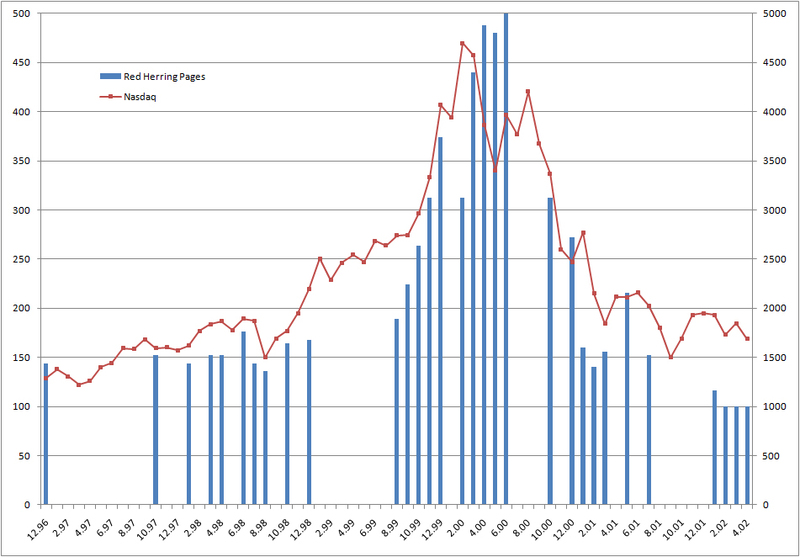 A decent number of pages before 1999, a peak in early 2000 and then a crash. I quickly did the exercise of comparing and here is the result! This entry was posted in Silicon Valley and Europe and tagged Red Herring on June 20, 2011 by Hervé Lebret. Do you have access to today’s numbers ? Could you produce the same analysis in 2011 ?